From 1 January 2016 deposit limit for bank accounts will be £75,000, and £150,000 for joint accounts. The £75,000 figure is the sterling equivalent of €100,000 as required by the recast Deposit Guarantee Schemes Directive. It's not immediately obvious, but you have to tab between the two lines in order to confirm the password. 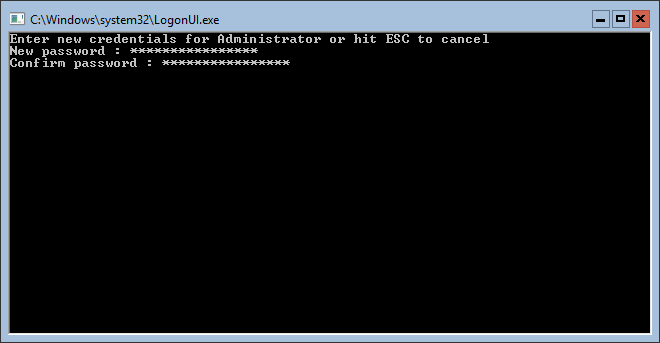 And a short while later you're logged into the host with a Command Prompt. I know I'd complained about the mix of Command Prompt and PowerShell interfaces and random modal alerts, but I wasn't expecting them to get rid of everything. I suspect that's a good thing, as this version (Server Core) appears to be designed for remote administration using Microsoft's Remote Server Administration Tools for Windows 10. Full details about how to manage this version are available here. Given the lateness of the hour, I decided the quickest way to get a server up and running to play with was to install "Server with Desktop Experience". I really like the Start Menu, it's similar to the Windows 10 one but without the annoying "Life at a glance" and "Play and explore" live tiles. A short while later I'd configured a static IP, enabled Remote Desktop, added the DNS role, and everything seemed fine. Although I did have the DNS Server service crash after making some configuration changes, which is a bit worrying (main thing was disabling recursion and deleting all the root hints). You can still use IE though. It took me a while to spot this, but my emails from early this morning were stuck in my Outbox (one of those emails was particularly important). The outgoing mail server settings work fine on my phone. They work fine to send the test email too (all 16 of them). But they didn't work in Outlook 2013 on Windows 10 for sending emails. After much tweaking of Outlook and the mail server, and checking of log files, I tried running the command "sfc /scannow" and this did detect and correct some issues. Which is odd, as it was a clean install of Office 2013 on a clean install of Windows 10. One long reboot later, everything seems to work perfectly again. I miss the good old days when Windows worked fine. Now I'm starting to hit the sort of issues I remember back in the days of Windows XP. On the plus side, Preview 3 of Android Marshmallow seems to be running okay on my phone after a dirty flash. It's apparently solved the Bluetooth bug that prevented it from working with my speaker, and perhaps the beta Fitbit app will work better too (seems to be working well so far). Just about coped with the absurdity of Wet Hot American Summer. But now there's a talking can of mixed vegetables. Too far. Too far. All the latest songs are at my fingertips on Amazon's Prime Music and I somehow end up listening to a couple of songs from the mid 1990s. The power button on my Nexus 5 appears to be dying. The phone got stuck in a boot loop because the button appears to be sticking/sensitive. After prising a thumbnail down the side of the case it's back up and running for now, but I probably can't get away with that for much longer. I've read that whacking the phone can help too, but again risks damaging the screen/phone. I don't want to buy a new Nexus 5 or 6 phone (or RMA my 5) before I buy the new Nexus phone (probably the LG, unless Huawei use the Snapdragon 820 or their own chip, as I'm not touching the 810 with a bargepole). At least I can fall back to my Nexus 4, but it's just not as nice or slick.